In the last couple weeks, I’ve had 3 separate experiences where I found this thought popping into my head. Believe it or not, in one of the conversations, I was the prospective client. In this instance, the person said, “Tell me about Sales Maven and how you work with clients.” Before I even got a chance to answer, she proceeded to tell me what she knew about Sales Maven, her experience in sales, and why I should hire her for a particular business service. It took her almost 5 minutes to answer the question she pretended to ask me (yep, I was timing it because I’m always fascinated with the way people communicate, and I teach a technique in Savvy Selling of how to have a conversation vs. give a “sales pitch.”). We ended the conversation shortly after without me having ever responded to her question. Do you think I gave her my business? Heck no! I don’t hire people who don’t know how to listen to their clients. She may have been excellent in her field; she may have had the very best intentions, and yet, she broke rapport big time when she asked and answered her own question without giving me a chance to respond. 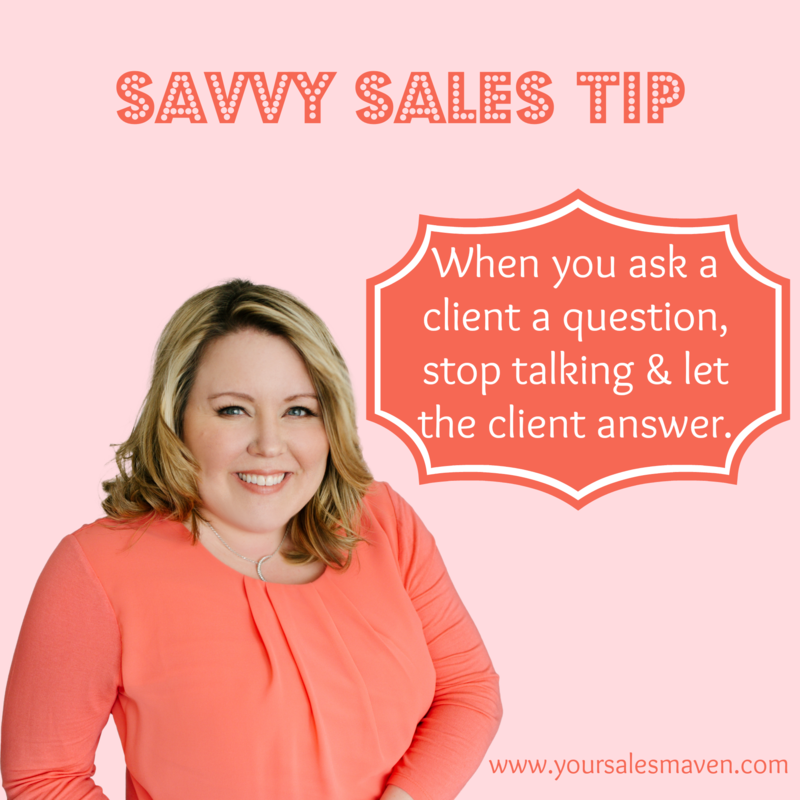 Your Savvy Sales Tip this week: When you ask a client a question, stop talking and let the client answer. When you ask a prospective client a question it’s not only good manners to let them answer it; it’s crucial to maintaining rapport. Sometimes we get so excited or nervous we tend to talk over our clients. We tell them what we think their answers are going to be or we tell them what we know about them, etc. Imagine a brand new balloon floating above your client’s head. Every time you interrupt or talk over them, see the balloon deflating. 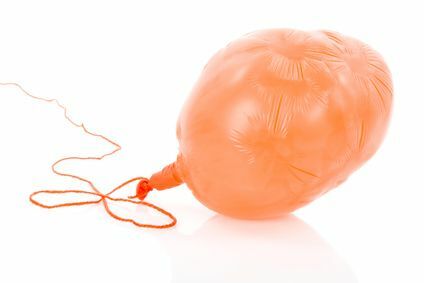 Not only are you sucking the air out of the room, but you may also be deflating their interest in you and your product/service. Of course, those of us that do this from time to time aren’t doing it to be rude or disrespectful. 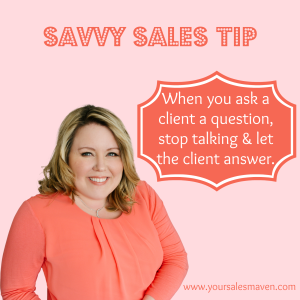 Regardless of your reasons, if you catch yourself answering questions you pose to clients, just stop talking. Let your client answer. The purpose of asking questions should be to gain information AND to build rapport with clients. Wishing you a ton of sales success this week.